- Season: spring / autumn fabric: 100% cotton features: Drawstring, Elastic waistband Size Measurementinches: 4T110 : Length: 24. 8" waist: 18. 1" hips: 28. 3" front Rise: 9. 1" 5t120 : length: 27. 2" waist: 18. 9" hips: 29. 9" front Rise: 9. 4" 6t130 : length: 29. 1" waist: 19. 7" hips: 31. 5" front Rise: 9. 8" 7t140 : length: 31. 5" waist: 205" hips: 33. 1" front rise: 102" 8t150 : length: 33. 9" waist: 21. 3" hips: 34. 6" front rise: 11. 0" 9t160 : length: 36. 6" waist: 22. 0" hips: 36. 2" front rise: 11. 4" please refer to the size chart before purchasing. Due to manual measurement, the size could have 1-3 cm error, thanks for understanding. Two front pockets and one back pocket on the right. KISBINI Big Boy's Cotton Elastic Sweatpants Sports Pants for Children - Kisbini is a registered trademark and the only authorized seller: KISBIMBO. - Camouflage pants, suitable for almost all saesons and occasions. Kisbini is a registered trademark and the only authorized seller: KISBIMBO. Soft hand feel, Lightweight, friendly to skin, windproof.2 side pockets and 2 back pockets. Lightweight, wind free, breathable, an ideal sweatpants for boys' sport & outdoor wear. Season: spring / autumn fabric: 95% cotton Size Measurementinches: 4T110 : Length: 24. 8" waist: 18" hips: 13. 8" 5t120 : length: 26. 8" waist: 18. 8" hips: 14. 6" 6t130 : length: 28. 7" waist: 19. 6" hips: 15. 4" 7t140 : length: 307" waist: 22" hips: 16. 1" 8t150 : length: 32. 7" waist: 22. 8" hips: 16. 9" please refer to the size chart before purchasing. KISBINI Boy's Cotton Camouflage Sweatpants Sports Pants Children - Due to manual measurement, the size could have 1-3 cm error, thanks for understanding. Fashion style cotton sweatpant. - Two front pockets and one back pocket on the right. Kisbini is not responsible for other sellers selling in a different, inferior quality product. Soft and comfortable hand feel, friendly to skin, durable to wear. Season: spring / autumn / winter for some south areas fabric: 100% cotton Features: Drawstring, Elastic waistband, Solid Quilted Pattern Size Measurementinches: 3T110 : Length: 21. 3" waist: 15. 7" hips: 26. 8" suggest age: 2-3 4t110 : Length: 24. 0" waist: 17. 3" hips: 27. 6" suggest age: 3-4 5t120 : Length: 25. 6" waist: 18. 1" hips: 29. 1" suggest age: 4-5 6t130 : Length: 27. 6" waist: 19. 7" hips: 307" suggest age: 5-6 7t140 : Length: 29. 1" waist: 205" hips: 32. 3" suggest age: 6-7 Please refer to the size chart before purchasing. KISBINI Boy's Air Cotton Active Long Pants Sports Sweatpants for Children - Due to manual measurement, the size could have 1-3 cm error, thanks for understanding. - 5-6 years =tag 130--Length:29. 9". Camouflage pants, suitable for almost all saesons and occasions. 1 x Pants. Fashion style cotton sweatpant. Thick and warm up lined pants: soft and cozy with Thick Thermal Fleece Lined for Winter, Help Your Kids to Withstand Cold Winter Night. Fashion athletic style cotton pant, solid simple quilted pattern. Soft and comfortable hand feel, friendly to skin, durable to wear. 11-12 years =tag 160--Length:37. 4". Soft hand feel, friendly to skin, Lightweight, windproof.2 side pockets and 2 back pockets. 2 kinds of pants available for you to choose:. Customer first, service Foremost" is the faith of our brand BINPAW. This comfy and practical pants came with humanized front and back pocket. BINPAW Boy's Cotton Sweatpants, Age 4T-14 4-14 Years - Kisbini is a registered trademark and the only authorized seller: KISBIMBO. Two front pockets and one back pocket on the right. Kisbini is a registered trademark and the only authorized seller: KISBIMBO. 7-8 years =tag 140--Length:32. 2". - Regular thickness pants for all season. Kisbini is not responsible for other sellers selling in a different, inferior quality product. Soft & smooth hand feel, Lightweight, friendly to skin, windproof.2 zippered side pockets. Soft and comfortable hand feel, friendly to skin, durable to wear. Fashion style cotton sweatpant. 1. Kisbini is a registered trademark and the only authorized seller: KISBIMBO. Kisbini is not responsible for other sellers selling in a different, inferior quality product. Camouflage pants, suitable for almost all saesons and occasions. Two front pockets and one back pocket on the right. Kisbini is a registered trademark and the only authorized seller: KISBIMBO. 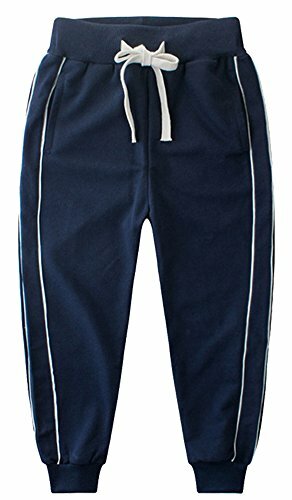 KISBINI Big Boys Cotton Sweatpants Sweats Athletic Pants for Children - Season: spring / autumn fabric: 95% cotton Size Measurementinches: 4T110 : Length: 25. 6" waist: 19. 7" hips: 15. 7" 5t120 : length: 27. 5" waist: 205" hips: 16. 5" 6t130 : length: 29. - Reasonable design, let the baby free exercise, lovely cartoon pattern, accompany the baby, give the baby a happy childhood . Kisbini is a registered trademark and the only authorized seller: KISBIMBO. Material: Cotton. Soft hand feel, friendly to skin, Lightweight, windproof.2 side pockets and 2 back pockets. Season: Spring and Fall. Camouflage pants, suitable for almost all saesons and occasions. Soft and comfortable hand feel, friendly to skin, durable to wear. Soft & smooth hand feel, Lightweight, friendly to skin, windproof.2 zippered side pockets. 2 kinds of pants available for you to choose:. Thick and warm up lined pants: soft and cozy with Thick Thermal Fleece Lined for Winter, Help Your Kids to Withstand Cold Winter Night. HUAER& Boys Cartoon Print Monkey Dinosaur Camouflage Pattern Cotton Pants Drawstring Elastic Sweatpants - Cartoon monkey, dinosaur, Star Print, Make Baby More Adorable. Size: for 2t 3t 4t 5t 6t 7T Boys. Size chart: 2t:length:52cm, waist:24cm 7t:length:72cm, waist:25cm due to manual measurement, waist:22cm 5T:Length:62cm, Waist:23cm 6T:Length67cm, Waist:21cm 4T:Length:57cm, Waist:20cm 3T:Length:54cm, please allow 0. 5inch-1inch/1-3cm error brand introduction： hUAER& products focus on children's health, choose high-quality fabrics, breathable, comfortable, soft, let your baby skin free breathing. Material: 95% Cotton, 5% Polyester. Osh Kosh - Ribbed cuffs. Kisbini is a registered trademark and the only authorized seller: KISBIMBO. Cartoon monkey, star Print, dinosaur, Make Baby More Adorable. Size: for 2t 3t 4t 5t 6t 7T Boys. 2 kinds of pants available for you to choose:. Active long pants, suitable for almost all saesons and occasions. Two front pockets and one back pocket on the right. Material: Cotton. Camouflage pants, suitable for almost all saesons and occasions. 2. 1. Soft & smooth hand feel, Lightweight, friendly to skin, windproof.2 zippered side pockets. Soft hand feel, Lightweight, friendly to skin, windproof.2 side pockets and 2 back pockets. Fashion style cotton sweatpant. Season: Spring and Fall. OshKosh B'Gosh Boys' Classic Fit Logo Fleece Pants - Active long pants, suitable for almost all saesons and occasions. Elastic waist band; side pockets and back pockets; Drawstring waist band; We choose the breathable, fine quality and soft cotton fabric to made out this pants for a comfy kids feel. Kisbini is not responsible for other sellers selling in a different, inferior quality product. - 7-8 years=tag 140--Length:32. 2". Regular thickness pants for all season. Material: Cotton. 2 kinds of pants available for you to choose:. Kisbini is a registered trademark and the only authorized seller: KISBIMBO. Two front pockets and one back pocket on the right. Lightweight, and soft fabric, slightly stretchy, simple and comfortable when wearing it. Elasticated waist; Functional Drawstring; Functional Pockets and Ribbed Cuffs. Kisbini is not responsible for other sellers selling in a different, inferior quality product. We are committed to the principle of Economical and Fashion! Offering the best service and the most economical product to our dearest customers. AOWKULAE Boys' Cotton Pants Regular Fit Athletic Pants for Boys and Youth - 2. Active long pants, suitable for almost all saesons and occasions. 5-6 years=tag 130--Length:29. 9". Kisbini is a registered trademark and the only authorized seller: KISBIMBO. Cozy fleece joggers. Fashion athletic style cotton pant, solid simple quilted pattern. Functional draw cord and pocket. - Material: 95% Cotton, 5% Polyester. Kisbini is a registered trademark and the only authorized seller: KISBIMBO. Season: Spring and Fall. They are popular with boy to wear in this fall and winter. Elastic closure, Easy to Wear. Fashion athletic style cotton pant, solid simple quilted pattern. Deal gift - featured toddle girls cartoon print long pants for autumn and Winter can be used as play-wear or home clothes. Soft & smooth hand feel, friendly to skin, Lightweight, windproof.2 zippered side pockets. Kisbini is a registered trademark and the only authorized seller: KISBIMBO. Material: Cotton. They are made from 100-percent cotton for breathable comfort and colors that last Lining that comes in contact with baby's skin is soft Interior elastic drawstring for size adjustment Roomy cut for easy movement Jogger style looks cool Fashion style cotton sweatpant. Jobakids Boys Cotton Pants Dinosaur Print Drawstring Elastic Sweatpants - Soft and comfortable hand feel, friendly to skin, durable to wear. Perfect for girls given in Holidays of Easter, Christmas, Birthday, Halloween and any other special festivals. Lightweight, slightly stretchy, and soft fabric, simple and comfortable when wearing it. Elasticated waist; Functional Drawstring; Functional Pockets and Ribbed Cuffs. Cartoon monkey, star Print, dinosaur, Make Baby More Adorable. - 4. Jobakids is a New Brand. Soft & smooth hand feel, friendly to skin, Lightweight, windproof.2 zippered side pockets. It can make your kids look different in the crowd. Fashion athletic style cotton pant, solid simple quilted pattern. But we try our best to provide the best quality and service for you and your kids. Good stitching and well made, durable. Deal gift - featured toddle girls cartoon print long pants for autumn and Winter can be used as play-wear or home clothes. 2 kinds of pants available for you to choose:. Declaration: product color on computer screen may vary due to lighting and screen pixel quality. Regular thickness pants for all season. Welity Boys' Cotton Jogger Pants, 4-12 Years - 3. Cotton blending&drawsting closure:the fabric of this toddle boy pants is very soft and breathable. Elastic waist drawstring closure design makes your kids fit and more comfortable, which can wear in school, home or other occasions. Elastic waist band; side pockets and back pockets; Drawstring waist band; We choose the breathable, fine quality and soft cotton fabric to made out this pants for a comfy kids feel. Contrast color stripes; Elastic waistband with drawstring pull on closure; Ribbed cuffs. Active long pants, suitable for almost all saesons and occasions. Material: Cotton. - We update this boys' pants with a new warm version which came with thicken fleece lined. But we try our best to provide the best quality and service for you and your kids. Super soft and lightweight Cotton Fabric Features Little Stretchy; Provides a Super Comfy Feeling. Kisbini is not responsible for other sellers selling in a different, inferior quality product. Lightweight, slightly stretchy, and soft fabric, simple and comfortable when wearing it. Elasticated waist; Functional Drawstring; Functional Pockets and Ribbed Cuffs. Soft hand feel, Lightweight, friendly to skin, windproof.2 side pockets and 2 back pockets. If you have any questions or problems, please feel free to contact us at first, we will do our best to solve it in time and positively : Thanks again for your time! Wish you have a wonderful experience buying from us. AOWKULAE Boys' Cotton Sweatpants Jogger Pants Trousers - Material: 95% Cotton, 5% Polyester. Perfect for girls given in Holidays of Easter, Christmas, Birthday, Halloween and any other special festivals. Lightweight, and soft fabric, slightly stretchy, simple and comfortable when wearing it. Elasticated waist; Functional Drawstring; Functional Pockets and Ribbed Cuffs. Elasticated waist; functional drawstring and Pockets; Ribbed Cuffs; These details express our goals "Comfortable, Skin Friendly and Newest Trend for Each Kid". 1.